Jacob Lakirovich holds a Diploma of Graduation from the State College of Music, Baku, USSR, a Professional Studies Certificate from the Music Academy Tel Aviv and Jerusalem, Israel and a Concert Artist Certificate from the Conservatorium of Music Luzern, Switzerland. His principal teachers were Rami Shevelov, Yair Kless, Boris Goldstein and Rudolph Baumgartner. Mr. Lakirovich has held positions in numerous orchestras in Europe, Australia and Canada, including Heidelberg Opera Orchestra, Germany, Principle Violinist for the Queensland Pops and Theatre Orchestras, Brisbane, Australia and Concertmaster for the Canadian Chamber Academy Orchestra. He appeared as a soloist and conducted chamber and youth symphony orchestras in many European countries, as well as Israel, Australia and Canada that were broadcasted on radio and TV, including the Radio Vatican. He was a Co-Founder and Director of the Stoliarsky School of Music, Brisbane and Sydney, Australia and former faculty at Sydney Conservatorium University of Wollongong, Australia and was involved in developing and teaching a program for gifted youth. 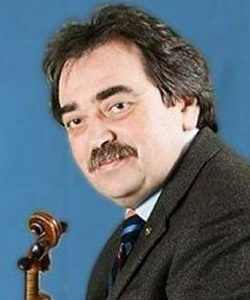 He is an active adjudicator for music festivals and competitions and has led many workshops on Violin Technique and Interpretation at international music festivals in Germany, Italy, Australia and Canada. He is a member Ontario Registered Music Teachers’ Association and also is a member of the Royal Conservatory of Music Examiner College and conducts string examinations across Canada. Jacob Lakirovich worked as one of the reviewers for the Royal Conservatory publication of the 2013 Violin Syllabus’ Violin Repertoire and Violin Technique and Etudes books. Many of his students are graduates from Universities and Conservatories of Music in Mannheim, Stuttgart, Brisbane, Sydney, Melbourne, New York, Cincinnati and Michigan and hold positions with the leading orchestras and universities in Europe and Australia. His students from Australia, USA and Canada are scholarship recipients of the Aspen Music Festival, Juilliard School New York, Universities of Cincinnati and Michigan, Vanderbilt University of Tennessee, City University of New York and Royal College of Music London, UK. His students have won Silver and Gold Medals in the RCM Examinations, and are the top prizewinners of various international and Canadian violin competitions. In 2013, two of his students were the laureates of the Cremona International Competition for strings in Italy. He was Artistic Director of International Youth Music Festivals and International Master Courses and Workshops in Brisbane and Sydney, Australia. Guest artists include Australian musicians: Roger Woodward, Professor John Hopkins, Alexander Semetsky, Max Olding, John Curro, as well as Professor Yair Kless (Israel), Professor Giuseppe Giglio (Italy), Dr. Felix Andrievsky (UK), Kurt Sassmannshaus (USA), Nelli Shkolnikova (USA), Ferdinand Schmitz (Germany) and Sir Yehudi Menuhin. He also directed the series of Annual Charity Concerts in aid of various organizations including Children Hospitals, SPELD, Drug-Arm and Rotary International. Most of the concerts were recorded by 4MBS FM Brisbane for the special radio broadcasts. Mr. Lakirovich is the founding director of the JVL Summer School for Performing Arts “Music in the Summer” Festival that brings together some of the leading performers and teachers from North America and Europe. Mr. Lakirovich served as head of the string department at the New Conservatory of Music in Toronto (1997 to 2013) and currently teaches privately in his studio in Thornhill, Ontario. He is also the past President of Rotary Club of North Scarborough, Canada and was named a Paul Harris Fellow, the Rotary Foundation of Rotary International award for his contribution to the community and significant assistance given for the furtherance of better understanding and friendly relations among people of the world.